Violence can happen anytime, anywhere, and to anyone. Are you prepared to defend yourself or your loved ones? The current times in America are very dangerous and unpredictable. Look at any news channel and you quickly realize that the concept of a “safe neighborhood” is an illusion. Violent criminals no longer have borders or areas they stay in. It’s happening everywhere and can touch anyone…even you or your loved ones. If your ready to prepare yourself for this very real possibility, you’ve come to the right place! 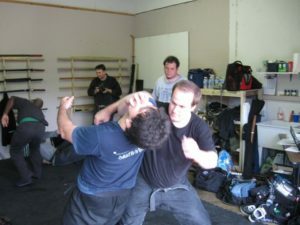 Assessment, Communication, and Tactics for self Defense. Assessment skills to avoid violence or respond appropriately. Communication skills to de-escalate hostile situations. And of course, physical tactics to survive when problems can’t be avoided or de-escalated. Our programs are designed to help you deal with any violent situation with the least amount of time, effort, and energy. If you are the kind of person that loves a challenge, wants to develop an indomitable yet humble spirit, and wishes to take your personal defense skills to the highest level of efficiency, then check out our Bujinkan Martial Arts program. This program is for those who are willing to put in the time and effort to achieve mastery! If you want state of the art self defense training, but your busy schedule prevents you from being able to attend on-going classes two to three times a week, then our weekend self defense courses are for you. These courses will give you the most essential skills in minimum time! Click the button below now for more information. Firearms are one of the most efficient ways to defend yourself in a life threatening situation. Our firearms courses are designed to train the responsible citizen beyond simplistic and unrealistic bullseye practice. 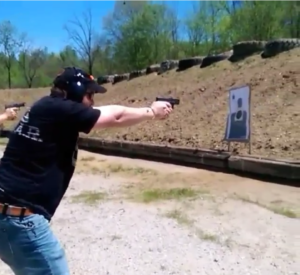 These courses are designed to make you a safe and competent shooter within the context of real world self defense. I’ve known and trained with this group since 2009. Tucker-Sensei’s instruction is always top-notch. I’ve definitely learned something valuable every time I have been able to train with him and his group. Tucker-sensei spends a vast amount of time studying personal defense from every conceivable facet, and then makes it a priority to provide that information in an easy-to-digest manner. Truly one of the top places to train anywhere. – Cody M.